Roy Andersson‘s A Pigeon Sat on a Branch Reflecting On Existence (En duva satt på en gren och funderade på tillvaron) opens, appropriately enough, in a reflective hall of mirrors. A shabby-looking man moves about the displays in a natural history museum, looking at an equally shabby-looking pigeon sat fixed on a branch facing an array of hostile predators – whether the birds of prey frozen mid-swoop in their cabinets opposite, or the Tyrannosaurus rex whose skeleton can be seen through the door to the room beyond. If the urban bird is embalmed and exhibited, then the unnaturally white makeup on the man makes him too resemble a preserved corpse, no less encapsulated, contained and framed by the unmoving camera’s wide shot than the pigeon by its glass case. As a woman – perhaps the man’s wife – holds her heavy shopping bags and observes the man with strained impatience, we observe both. While this programmatic scene may take place in a showroom for animal life, in Andersson’s film it is the human species that will be very much on display, in a series of compartmentalised exhibits that showcase all our avarice and aggression, our banality and vulnerability. A Pigeon Sat on a Branch Reflecting On Existence is instantly recognisable as a part – in fact the the third and final part – of Andersson’s “trilogy about being a human being.” Here, as in Songs From the Second Floor (2000) and You, the Living (2007), a series of sketch-like episodes are captured by an immobile camera whose very aloof distance from events serves to render human, and absurdly humorous, all the unfolding frailties, follies and foibles. The everyday locations – the bars and barber shops, ferries and apartments, offices and bus stops, restaurants and dormitories, the interiors and exteriors – have in fact been painstakingly built from scratch in Andersson’s Stockholm studio, so that they come with a constructed hyperrealism that ever so subtly defamiliarises their mundanity. All these stylised tableaux are populated by an ensemble of grotesques, deadpanning their way through postures of longing, melancholy and craven selfishness. Andersson’s hermetic microcosm of human experience is a place of sombre browns and greys, where folk sleepwalk through lives barely lived, ashen-faced in panstick that makes them resemble no less than the undead. Little wonder, then, that the film’s museum prologue is followed by a triptych of sketches expressly unified by the theme of “meetings with death” – or that Jonathan (Holger Andersson), a recurring depressive who is as close to a protagonist as this film has, is seen at times dressed in vampire’s teeth or said to walk like a zombie. In Andersson’s bleak vision of humanity, we all occupy an ambiguous limbo between the living and the dead. Where Jonathan’s work peddling novelty items sees the lugubrious salesman repeatedly donning the masks of monsters, Andersson also likes to disinter monstrosities buried beneath the foundations of our civilisation. 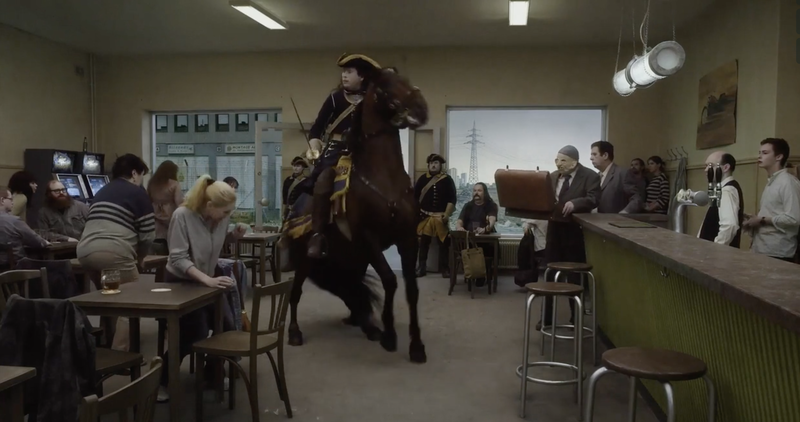 The surreal invasion of a bar by a mounted Charles XII and his armed militiamen suggests an easily resurgent fascism – Charles’ name is often invoked by Swedish Neo-Nazis – while a nightmarish vision of African slaves sacrificed for the aesthetic pleasure of a moneyed élite points to the atrocities of colonial exploitation upon which modern Western society has been built. Here, history forms part of a continuum with the present, as exemplified by the scene in which an old, deaf man in a pub is shown inhabiting his memories of the same venue in 1943. In all these vignettes, Andersson brilliantly captures the absurdity of homo sapiens, be it the lovesickness of a flamenco teacher, the disorientation of a military man, the nausea of a ship’s captain, or the callous disregard of a lab technician. And even if he offers occasional observations of great affection and tenderness, like the mother kissing her giggling baby’s feet, or the lovers sharing a post-coital cigarette as they look out of their window, for the most part his focus is on our species’ pettiness, venality and meanness, with horror and despair never far behind the drollery. Jonathan may wish “to help people have fun”, but the demands of the marketplace and the shortcomings of his own all-too-human personality make him a rather improbable entertainer. Perhaps the same is true of Andersson himself, but the clash between joy and sorrow in this work creates a uniquely rich and contradictory exhibition space for reflection upon our existence.